The German language has always been important to me. Since my father lived in Switzerland for nearly three years before I was born, I can always remember him using certain German phrases when he spoke to me. He would say things, such as "Sei brav!" and "How does it schmeck?" which mean "Be good!" and "How does it taste?" respectively. Interestingly, I remember growing up, thinking that these phrases were actually English words. Ever since that time, I have taken a great affinity to the German language and have always understood at some level its relationship with the English language. Having lived in Germany for two years myself and having studied the language as an undergraduate, I appreciate the opportunity I have to offer a brief history of the German language for all to read and enjoy. This paper will describe the various time periods that are considered most important to the development of the German language, and briefly indicate where possible what types of changes (morphological, phonological, etc.) have taken place. 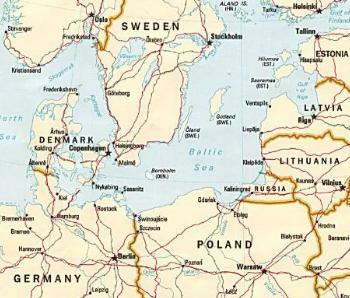 Stedje (1989) points out that Proto-Germanic (PG) probably began to develop as far back as about 2000b.c., as Indo-Europeans began to settle western areas of the Baltic Sea (see Appendix A), and ended about 500b.c., when the differences had become evident enough to discriminate PG from other languages. One area of difference between Proto-Indo-European (PIE) and PG was the Great Germanic Sound Shift. We see from Figure 1 that PIE voiceless stops p, t, k became in PG the corresponding f, ¹ , x. The b, d, and g shifting to p, t, and k also belong to this sound shift. This phenomenon was first described by the Danish philologist Rasmus Rask. Later, the German scholar Jakob Grimm expressed his comparative Germanic grammar called Lautverscheibung and later called Grimm’s Law, which described the systematic and regular shift of these Germanic consonants (Nielsen 1989). From the beginning, Proto-Germanic language drew heavily upon its own resources in the creation of native vocabulary, particularly in the areas of agriculture, animal husbandry, hunting, and warfare. "Approximately a fourth to a third of the Modern German vocabulary is uniquely Germanic in origin, no Indo-European cognates of these words have been found," claims Waterman (1966: 36). However, as a result of contact with the Roman culture, countless terms were borrowed. For example, words such as dt.Fenster and dt.Kampf are clearly related to lat.fenestra and lat.campus respectively (Waterman 1966: 35). As scholars have tried to derive some scheme of linguistic development of this time period, they have been faced with many difficulties. The fact that there are few written artifacts to be found before the eighth century has hindered the ability of scholars to clearly define the beginning of the Proto-Germanic era. Around the fourth century, because of the Roman influence, Christianity became prominent (Waterman 1966: 45). This fact is important to remember, because it is the clergy of the time that was largely able to pass on the language. According to Waterman (1966: 71), the study of Old High German (OHG) can best be undertaken by studying the written manuscripts of various monasteries of the time, including St. Gall, Reichenau, and Regensburg. From Old Saxon, a prominent dialect of OHG, many important linguistic artifacts have been found. The most important artifact relevant to the knowledge of Old Saxon is by far the poetic manuscripts of the life of Christ from the ninth and tenth centuries named Der Heliand (Heiland "Savior"), written by a monk or student of the Fulda monastery (Stedje 1989: 81). The author attempted to relieve some of the burdens of the Saxon missionary work by bringing the Christian philosophy in line with current German thought at the time. At this point the similarities between Old Saxon and German are quite clear. Particular lexical items began to resemble Modern German forms, such as so, liebe, and gode (see Figure 2). Middle High German (MHG) differentiated itself from OHG through toned down additional syllable vowels and a more analytic syntax. MHG differentiated itself from Early New High German, the next stage of the German language, through long vowels, such as iß uß ui [y:] and diphthongs ie ou üe. The umlaut began to spread to all vowels, where in OHG this phenomenon had only affected the a.
Additionally, MHG was the first common language of the people that was the language of chivalric poetry (Stedje 1989; Waterman 1966). Myths and legends from the Germanic past were written down in poetic forms. Borrowings in the "language of the Knighthood" were particularly influenced by French loanwords. For example, French hunting terms that still exist in the German language include co(u)ple, which in Germanic is Koppel, meaning "a string of dogs", and berser, in Germanic birschen, meaning "to stalk game" (Waterman 1966: 91). During the time of 1200-1350 the German people wrote mostly using their local dialects, starting with southern Germanic regions, gradually spreading throughout other Germanic settlements, although Latin documents were still in the majority. The phonology and vocabulary of the different regions and cultures tended to be different almost from one house to the other. Only the styles were similar. There were four major phonological differences between MHG and NHG. First, short vowels in open syllables were usually lengthened. For example, MHG had the word le( -ben (to live), which became leß -ben in NHG. Second, long vowels in closed syllables tended to become short. For instance, MHG had the word haß st (have, 2nd person, singular), which became ha( st in NHG. Third, MHG long vowels iß , uß , u_ ß were diphthongized to ei, au, äu. For example, MHG had the word liute (people), which became Leute in NHG. And finally, MHG diphthongs ei, uo, üe were monophthongized to the long vowels iß , uß , u_ ß . For instance, MHG had the word füeze (feet), which became Füße in NHG (Waterman 1966: 103). The differences in the morphology of MHG and NHG were often a result of analogy, or the leveling of morphological patterns more towards one from or another (McMahon 1994). One example of this phenomenon was the declension of feminine nouns; in the singular, the form of the nominative spread to all the oblique cases (see Figure 3). It was not until about 50 years after Johannes Gutenberg had invented the printing press (about 1440) that the printing technology had progressed enough to allow for less expensive book publishing. Once technology had progressed, the printing industry quickly grew. The first books printed by the Germanic people were mostly in Latin, which continued throughout the time period of Early New High German. Around the year 1500 there were about 80 German printing companies. Naturally, the oldest Germanic documents to come from this time period were still very strongly influenced by local dialects. During the sixteenth century, four distinctive Upper German Druckersprachen ("printer languages" that were languages influenced by the local dialect) developed: (1) Austro-Bavarian, (2) Schwaben, (3) Upper Rhenisch, and (4) Zürich Swiss (Waterman 1966). Eventually, however, attempts were made to remove all dialectal expressions and to improve the syntax of the printed document. Perhaps the most notable and clearly influential occurrence in the development of the German language was a result of the work of Martin Luther, as he is often referred to as "the creator of New High German" (Stedje 1989: 124). Although it is not claimed that Luther "created" the Modern German language, his influence cannot be underestimated. In 1522 Martin Luther translated the New Testament from the original Hebrew into an "East Middle German" style (Waterman 1966: 129), which was followed by the translation of the Old Testament in 1523. His translation of the Bible had such a wide distribution and acceptance that the East Middle German dialect in which it had been written came to serve as the authoritative exemplification of modern High German. It is interesting to note that the original translation of 1523 is still very intelligible to German speakers today. As a result of the invention of the printing press and Luther’s widespread influence, the written German language began to solidify. In fact, although the spelling (i.e. accent) of the 1534 translation may different than Modern German, the word selection and order would be considered perfectly good German today. Despite the progress made in the sixteenth and seventeenth centuries to develop and maintain a Nationalsprache (national language), French still continued to be considerable influence on the German language because it was the language of the German courts. During the reign of France’s "sun king", Louis XIV (1643-1715), it seemed that French was very much in fashion with the upper and middle classes (Walterman 1966: 137). Not surprisingly, however, societies began to develop that were against the influence of foreign languages on German, more particularly dedicated to the preservation and purification of the German language. These societies may not have had a great impact on the attitudes of the upper classes nor changed the language of the courts, they did have relative success in influencing the language of literature. In fact, many words that were borrowed from another language were then coined in the German language of this time (see Figure 4). It is interesting to note that in Modern German, both forms shown above are still in use. Depending on the dialect or region, one form may be preferred over the other. By the eighteenth century, German-speaking lands had generally adopted a written language, even though common spoken language continued to be marked by local and regional variations. One of the most influential literary works from this period was published in 1624 of Opitz’ Buch von der deutschen Poetery (Book of German Poetry) (Walterman 1966: 148). Opitz advocated the language of Luther (see section IV above) as the most appropriate dialect for the German language. Naturally, the standardization of the German language during this time period was mostly seen in the written language. However, it is difficult to determine how much standardization was actually accomplished. Dialectal and regional influences continued to have a large impact on the language and the literature of this time period. Most linguists agree, however, that the influences that lead to a standard High German were not to be realized until well into the nineteenth century. Today there continue to be many variations and dialects of the German language. For example, I had many fun and interesting experiences with various German dialects while living in southern Germany. My experience with learning German largely came while living in an area of southern Germany called Schwabenland, where you find the Black Forest. While living in two small towns called Villingen-Schwenningen (near Augsburg) and in Esslingen (near Stuttgart), I naturally learned to speak Schwäbisch (the local dialect of the Black Forest region). Most of this process was not conscious to me, although I did occasionally practice my Schwäbisch with some of the local people. In fact, at one point I purchased a Schwäbisch narration of the story of Moses to help this along. After living in the area for about one year, I moved to Munich, the capital of Bavaria, where the local dialect called Bayerisch is quite different from Schwäbish. Surprisingly, the local people immediately noticed that I spoke with a Schäbisch accent, resulting in many questions about where I had learned German. Also, during a trip to Innsbruck, in northern Austria, I needed to purchase some aspirin at a local pharmacy. When I went to pay, the store clerk asked me if I wanted to pay in German marks or in Austrian schillings. Once again, I was surprised at the question, but later realized that the clerk could tell from my accent where I had learned German. My exposure to German dialects included variations in Swabian, Bavarian, Innsbruck, Swiss German, Platt German, and Berlin German. Although there has been an argument to consider Swiss German a separate language, all of these dialects of German have their individual characteristics and are generally mutually intelligible. Consequently, from these experiences and doing the research for this paper, I have come to have a greater appreciation for the German language and its rich and varied history. From studying the major time periods of the German language, one might also find enjoyment in postulating the history of other related languages, including English. During the past 50 years, great changes have taken place in the fundamental and theoretical study of the German language. Some may believe that there is nothing more to do in the study of the German language. However, there is great value in continuing to study the history of the language to better understand how changes occurred and how they might occur in the future. Even though we live in a small world, where printed language may tend to "stabilize" language according to some, I cannot think of a day when language will cease to evolve. Crowley, T. (1992) Historical Linguistics, 2nd ed. New York: Oxford University Press. Homeyer, H. (1947) Von der Sprache zu den Sprachen. Switzerland: Verlag Otto Walter AG Olten. McMahon, A. M. S. (1994) Understanding language change. Cambridge ; New York : Cambridge University Press. Microsoft Corporation. (1997) Microsoft Bookshelf 98. Nielsen, H. F. (1989) The Germanic Language. Tuscaloosa; Alabama: The University of Alabama Press. Robinson, O. W. (1992) Old English and Its Closest Relatives. Stanford; California: Stanford University Press. Stedje, A. (1989) Deutsche Sprache gestern und heute. München. Wilhelm Fink Verlag. Waterman, J. T. (1966) The History of the German Language. Prospect Heights; Illinois: Waveland Press, Inc.